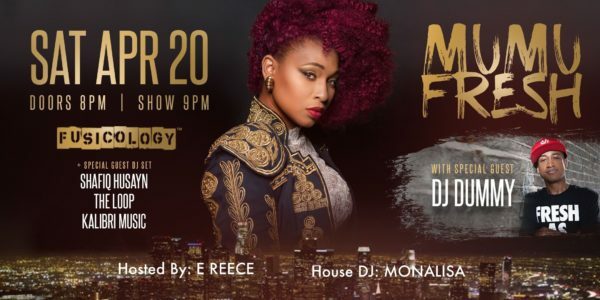 Come enjoy Grammy award nominated Singer/Songwriter Mumu Fresh Live at The Gypsy Palace known as Awa Oasia in Downtown Los Angeles. Mumu Fresh is a refreshing taste to today’s music scene. Mumu Fresh is a rare breed multifaceted artist serving Jazz, Hip hop, R&B with a powerful voice filled with pure soul. Joining her to move the crowd on the turntables none other than DJ Dummy her collab partner from “The Vintage Babies” & J.Cole’s Tour DJ. The show opener is the Majestic Kalibri Music & this event will be hosted by Baltimore Rapper & native E Reece. Make plans to close out the evening with us by staying for A Special DJ Set from Shafiq Husayn of Sa-Ra spinning his new Album The Loop. The Resident DJ is L.A Legend DJ Monalisa. This event is going to be smokin hot for 4.20! MUMU FRESH IS THE TRUTH.